The distinctive Charminar is undoubtedly the most iconic landmark monument in Hyderabad. Its unusual appearance compels curiosity and wonderment. What's the significance of it? How did it come to be there? Find out all you need to know in this complete guide to Hyderabad's Charminar. If you're planning on taking a flight, this information about Hyderabad airport will assist you. Hyderabad developed over centuries of prosperous Islamic rule and the Charminar is a signature remnant of this glorious past. It was actually made to be the city's centerpiece when Sultan Muhammad Quli Qutb Shah, the fifth ruler of the Qutb Shahi dynasty, shifted his capital to Hyderabad from nearby Golconda Fort. The Sultan founded Hyderabad in 1589 and the Charminar was completed two years later, in 1591. As the first building, it served as a reference point for the city's layout, which spread out from it in four quadrants. Hyderabad's design, including that of the Charminar, reflects the Iranian origins of the Qutb Shahi dynasty and its Prime Minister Mir Momin Astarabadi who conceptualized the city. He modeled Hyderabad on the magnificent Persian city of Isfahan, and used Persian chahar taq ("four arches") symbolism of the cosmos as inspiration for the Charminar. The Indo-Islamic architecture of the Charminar features a vast suspended space, with contrasting lofty arches and soaring towers. It was considered to be groundbreaking and is still regarded as a masterpiece. Not only was it replicated in later Islamic buildings in India, the structure formed the basis of a similar Charminar in Bukhara in Uzbekistan. The Charminar gets its name from its four towers ("char" meaning four, and "minar" meaning tower). As well as being ceremonial gateway, the Charminar is also a place of worship. The towers are actually minarets that are part of the oldest mosque in Hyderabad, on the top floor. During the reign of the Qutb Shahi dynasty, the Charminar was used as a madrasa (Islamic college) too. What's interesting is that there's a mysterious Hindu temple, dedicated to Goddess Lakshmi, at the base of the Charminar. Its existence, in a Muslim-dominated area, is a matter of ongoing controversy as no one knows for sure when it was established or why it's at the site of an ancient Islamic monument. Cobblestones and granite pavement have been laid in the pedestrian zone. The Charminar is also being given a makeover under the Ministry of Drinking Water and Sanitation's Swachh Bharat (Clean India) Mission initiative. It has been named as one of the Swachh (Clean) Iconic Places in India and adopted by the National Thermal Power Corporation, which will carry out beautification works. This includes providing decorative lighting, battery-operated vehicles for visitors, toilets, ATMs, and other facilities in the vicinity. The Charminar is open daily from 9:30 a.m. to 5.30 p.m. Ideally, it's best visited before noon, while it's relatively quiet. The crowd swells considerably on Fridays, when locals come to pray, and on weekends. 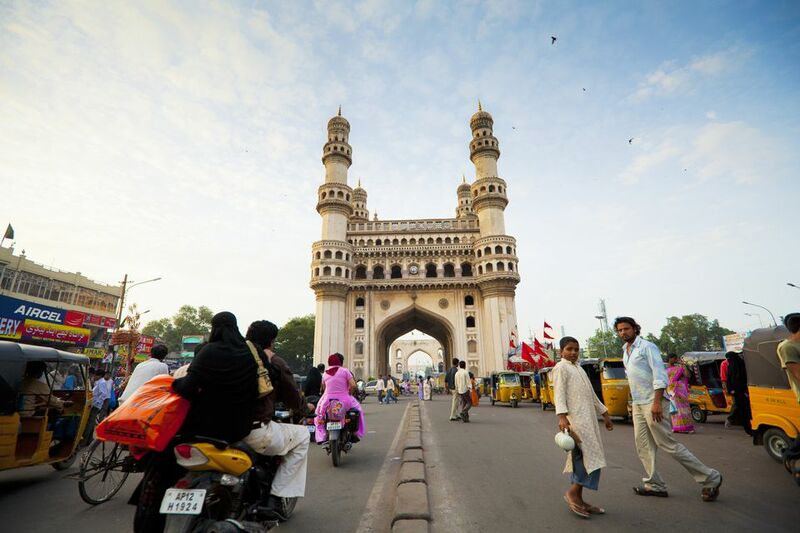 To reach the monument, take an auto rickshaw, taxi, or bus to Hyderabad's Old City. It's worth going into the Charminar for the view. If you buy a ticket, you'll be allowed to climb up one level through the spiral staircase in one of the minaret towers. The ticket price increased in August 2018. The cost is now 25 rupees for Indians and 300 rupees for foreigners. Do note that, for security reasons, you won't be allowed to carry any bags. For a fee, they can be left at a storage counter outside the Charminar. There have also been reports of guards not allowing single women to enter the Charminar because of supposed safety concerns. No formal rule exists about this though. Photography is permitted but you'll need to pay a 25 rupee camera charge. Consider visiting the Charminar on a guided tour, such as this recommended Charminar Precinct Walk offered by Hyderabad Magic, if you're likely to feel overwhelmed or want a more immersive experience. The main attraction is undoubtedly the view across the Old City to other evocative historic landmarks such as Mecca Masjid. However, the floor of the Charminar that's accessible to tourists also has 45 mushallas (prayer blocks), delicate stucco floral decorations, and ornate balustrades and balconies. In addition, keep an eye out for the cat's head that's carved into the top of one of the arches on the eastern side of the Charminar. If you visit the Charminar between 7 p.m. and 9 p.m., you'll be able to see it beautifully illuminated. The Old City neighborhood around the Charminar is fascinating to wander through, as it really brings Hyderabad's Islamic legacy to life. Mecca Masjid, built in 1694, is only a few minutes walk south of the Charminar. It's a massive mosque complex with a tranquil pond in the middle of it. Opposite it is 200-year-old Chowmahallah Palace. This imposing official residence of the Nizam rulers has been converted into a museum, with a collection that includes vintage cars and other regal memorabilia. Badshahi Ashurkhana is about 15-minute walk north of the Charminar, near the High Court. A royal house of mourning for Shia Muslims during Muharram, it's adorned with colorful enamel-tiled mosaics. If you're a foodie, don't miss trying the authentic Hyderabad biryani at Hotel Shadab near Badshahi Ashurkhana. This famous dish originated from the kitchen of the Nizams, and is a blend of Iranian and Mughlai cuisine. Hyderabad's fiery cuisine and street food can be explored further on this Mir Alam Market Walking Tour. If you don't want to take a tour, you can see the market for yourself after a 10-minute walk northeast of the Charminar. Want to explore the city further? Check out these essential things to do in Hyderabad. If you have kids, they'll appreciate a trip to Hyderabad's Ramoji Film City or Wonderla Amusement Park as well.